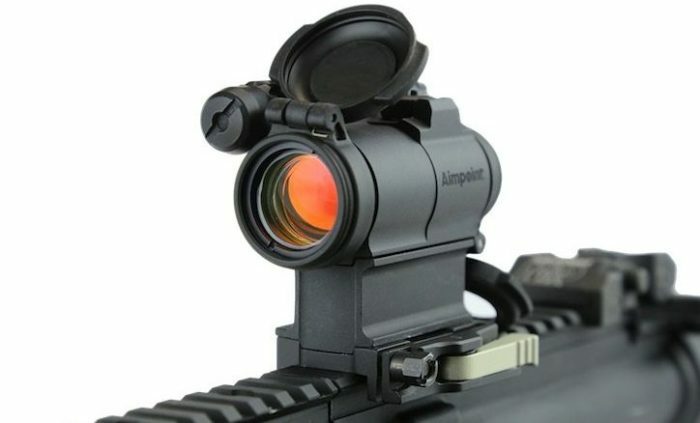 Aimpoint’s newest Comp M5 red dot optic is the lightest in the series. Aimpoint® continues to expand their already impressive line of red dot reflexive optics with the new Comp M5™. Officially released on September 12th, 2017 the company had allowed a few tester optics to slip into the field prior to the official release. Our friends at The Firearm Blog had posted back in May of the potential release of the Comp M5, and that news has now become official. The new Comp M5 offers several of the features that have enshrined Aimpoint as a world leader in reflexive optics, and expands upon previous models in areas near and dear to any shooter. The new Aimpoint Comp M5 promises to be very competitive in the compact red dot optic market. The new Aimpoint Comp M5 is the smallest optic in the Comp Series. Aimpoint’s new Comp M5 is the most compact optic in the Aimpoint Comp™ Series optics. Weighing only 5.19 ounces, the Comp M5 is powered by a single AAA battery. This combination makes the Comp M5 an incredibly desirable optic for many reasons. Interestingly, Aimpoint had originally designed the Comp M5 for the specific needs of an “official” end-user (read: Government military contract). It should not come as a surprise that Aimpoint quickly saw the advantage of offering the Comp M5 to the much larger civilian market. The Comp M5 will feature much of the same outstanding technology that has made other Aimpoint optics leaders in their field. The transition to a single AAA battery makes powering the Comp M5 easy and affordable throughout the world. In addition, the alkaline nature of the AAA battery makes shipping and storage of batteries safer than the lithium batteries that have become so common with high-end optics and flashlights lately. The Comp M5 does not sacrifice battery life by transitioning to a AAA battery. 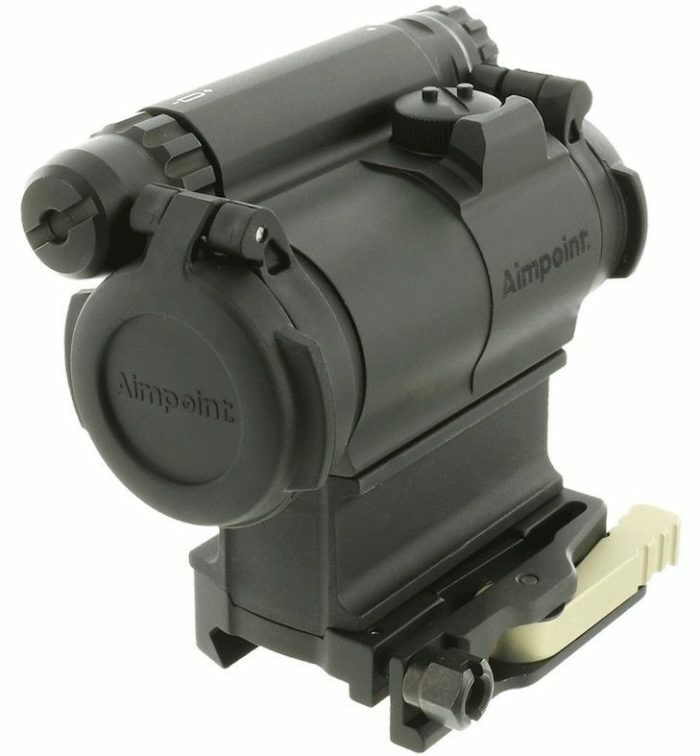 Aimpoint still stands by its claim of extremely long battery life for the Comp M5, with over 5 years of constant-on use at the mid-range intensity setting of seven. The battery compartment is located high and to the right on the optic housing, making battery changes (if needed) very easy and quick. The Aimpoint Comp M5 will come with low and high (shown) mounting risers. Fogproof housing and lens design. Military-grade optical lenses provide the Comp M5 with outstanding light transmission. Lens quality is critical for target acquisition and clarity in both day and low-light conditions. In addition, the lens quality provides a crisp dot for aiming, unlike cheaper optics that often give a blurry aiming point. Aimpoint Comp M5 optics are designed to be parallax-free, so the shooter should not have to worry about blurred targets at various distances. This is true even when using a magnifier in conjunction with the Comp M5. The Aimpoint Comp M5 with included 39mm riser and LRP QD mount. MSRP: Not listed, estimated over $900.00. Compatibility is key to military, law enforcement, and competition optics. As the mission changes from close quarter to distant engagements, shooters demand an optic capable of making the adjustment. 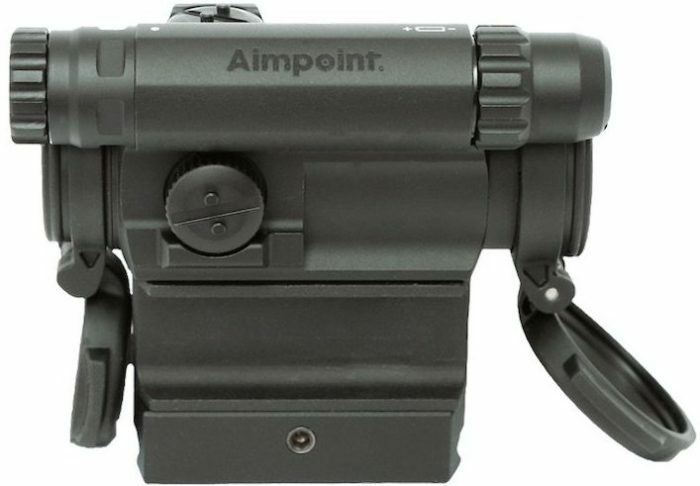 Aimpoint optics, including the Comp M5, are fully compatible with all generations of night vision devices (NVD), as well as Aimpoint’s professional magnifier line. Designed and manufactured to extremely high tolerances, the Aimpoint Comp M5 will withstand full submersion in water up to 45 meters (150 feet). Most of us are just happy the optic will withstand getting rained on, or dropped in a puddle, but it makes clear the Comp M5 was tailored towards military special operations, where making a water infiltration is a common expectation. Lightweight, low-profile, and a simple AAA battery highlight the Comp M5 features. 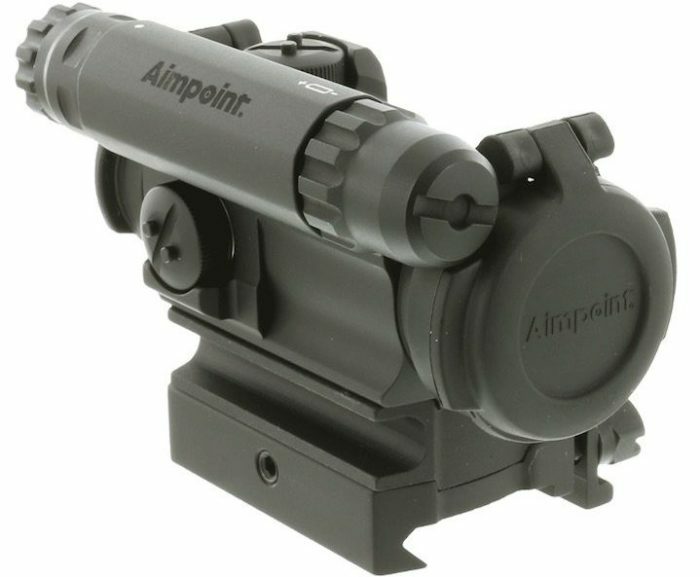 There is no doubt that Aimpoint continues to be a leader in red dot/reflexive sight technology. The company that started it all, continues to produce outstanding products with end-user needs in mind. The new Comp M5 appears to be another home run for a company with many stars in its line up. The more compact and lightweight housing are great benefits for all shooters. Transitioning to a simple AAA battery over more expensive Lithium batteries is another big win for this optic. However, the price is prohibitive. Many agencies, and especially officers, just cannot justify forking over nearly $1000 for an optic, especially a simple red dot. Lightweight and AAA battery are great features, but do they really warrant nearly double the price of an Aimpoint PRO? Personally, I don’t think so. BlueSheepdog Crew highly recommend shooters use red dot or reflexive sights on their AR-15 or similar style patrol rifles. The speed of target acquisition cannot be matched with basic “iron” sights. 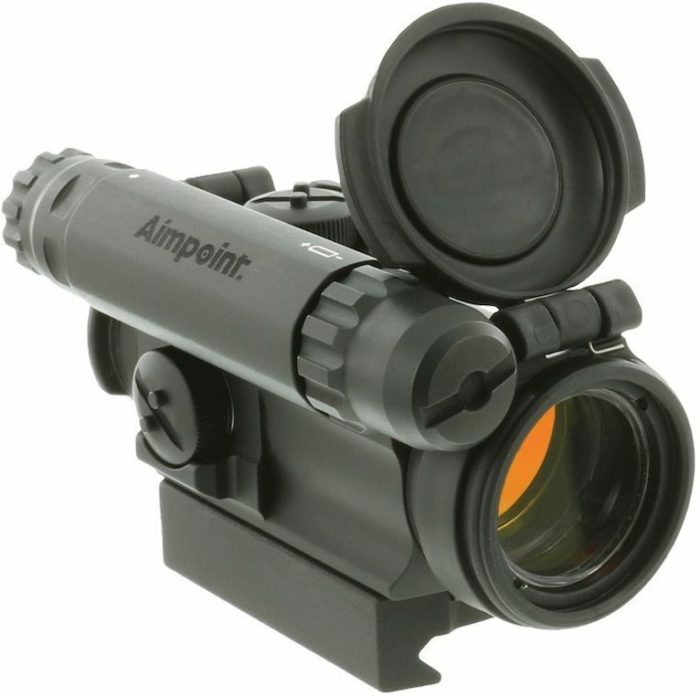 Aimpoint makes some of the finest red dot optics on the market. Though they are pricier than some, the clarity, durability, and long-lasting battery life are well worth considering when choosing an optic. The Comp M5 may just have to be an option for those more financially gifted. 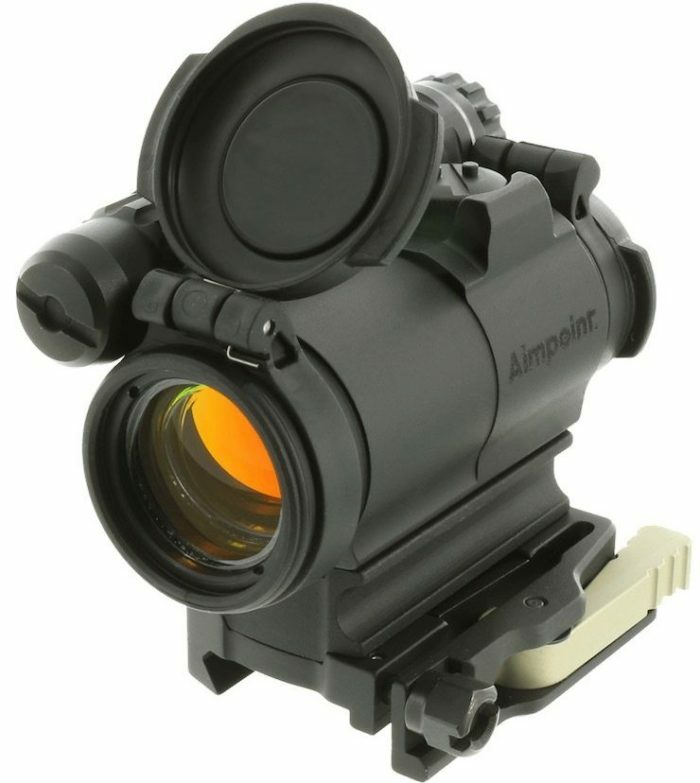 The Aimpoint Comp M5 comes with the optic, lens covers, 39mm riser, and LRP mount. Having been former law enforcement, my only concern, (as we all have been constantly exposed to it) is why is it that theft of this expensive equipment has not been addressed!!!??? It is so easily removed. Hunt camps have so many personalities!